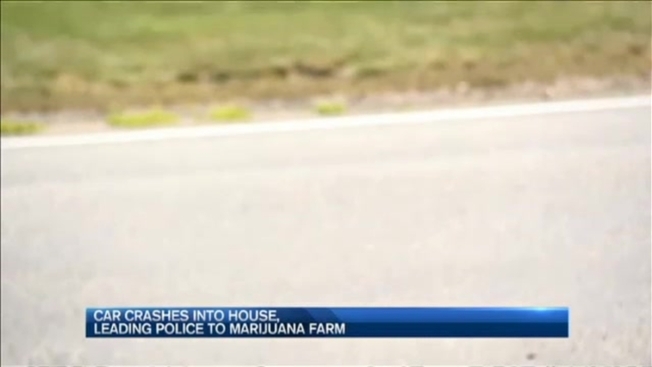 A car crashing into a house in Salem, New Hampshire, led police to what they're calling a marijuana farm inside a house. Police responded to a motor vehicle crash on North Main Street Wednesday evening. Upon arrival, police learned that the elderly man from Methuen, Massachusetts, backed out of the driveway. He drove 30 feet and crashed into a residence at 64 Main St, striking an exterior bedroom wall. "The car was in the corner of the house by several feet," said neighbor Dave Topham. Everyone was OK, but while surveying the structural damage, officials made an unexpected discovery. "There was a false wall that had been exposed and they found what they believe was a marijuana growing operation," said Salem Police Sgt. Jason Smith. Smith calls it a hidden and rather sophisticated marijuana farm. "With its own ventilation, lighting system, duct work, and some plants," he said. The homeowner wouldn't answer the door on camera, but once necn stopped rolling, the man said he is not a criminal, and that the "false wall" was the beginning stages of a new bathroom, and that the plants were actually flowers he was growing for his garden. "He's always out doing his lawn and planting his garden, so it was a total surprise for us, said neighbor Kristen Farrah. "We had no idea." Police are still investigating and have not yet filed any charges. "If someone was growing marijuana there, it was very bad luck for them," Sgt. Smith said. "It was like getting hit by a meteor." Neighbors aren't jumping to conclusions. "I guess we will have to wait and see," Farrah said. Police say it's likely the 12 plants will be sent to the state lab for testing.